Nifty — Deja Vu — Pattern Repeat or Change on Cards. The chart above clearly gives a feeling of deja vu and a repeat of previous cyclic drops. But the only concern is generally after 4 attempts at a similar cycle the trend changes and we may see a new formation. So currently one may now wait for a break below 5000 to only confirm a similar pattern being played again but i would still doubt it. Also the recent double bottom done at 4700 makes the current downtrend to get weaker and we may well get into a sideways market. One more consideration is smallcaps have started taking a hint in the current move. This is one of the best indications when markets start seeing selling in any leveraged balance sheets or any one looking to raise money. Will update more on this ( just back ) but Investors should not get bothered by the current drop and rather prefer to shift stocks and get into stronger quality stocks. Also do not buy a stock just for the reason it has fallen 50 % but do a bit more analysis. The drop in quality stocks may be temporary. Focus on Quality !! irrespective of index but go slow in buying and set your comfort entry points. Some of the stocks which we are looking to buy --- NESCO , Godrej Inds , Smartlink ( below 45 ) . How Smartlink going to grow in future(I know about its cash)? Is Godrej Ind.s not expensive holding cos? Is Bajaj Hold not cheaper holding cos than Godrej Ind.s? 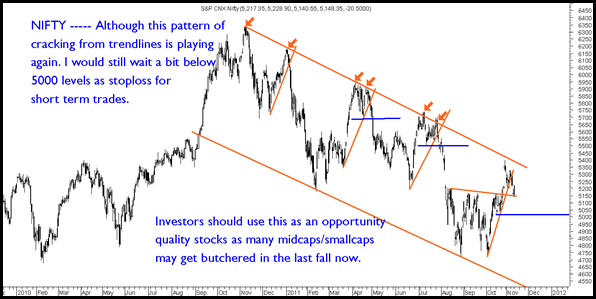 After the reading the above posts you will know more about the detailed risks and growth possibilities in the above stocks. 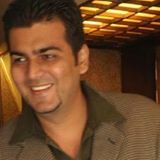 For Smartlink there is a good comment by Atul you can read for the growth angle. Above all do your own due dilligence. My view remains very bullish on the above 3 stocks. Is Nesco not vulnerable to property price drop in Mumbai???? Already Mumbai property prices are sky rocketed. No doubt zero debt make sure that they will survive no matter how much Mumbai property prices fall. But what about growth predictability. The stock did not go as expected. Stoploss was around 70-73. You should have exitted it if not then do it now.